In our last episode, I showed you how the blue-sky-clouds picture from several months ago became a dark, scary mass of shadowy clouds. 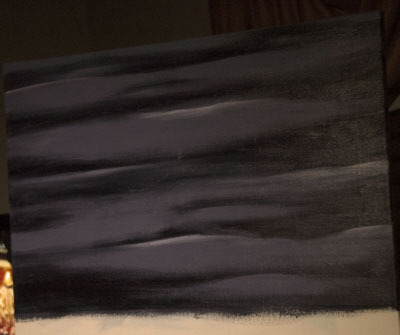 That entry told the story of the top half of the canvas, and the entry included a short video! So, now we come to the lower half of the canvas. When this was originally a sunny blue sky, the lower half had never been touched. It was time to start. 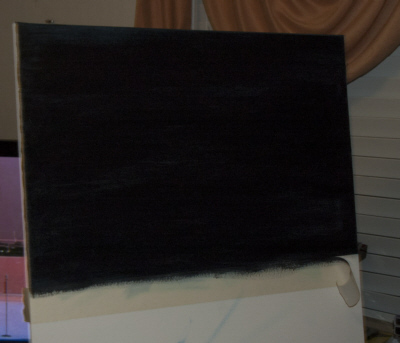 So, the first thing done was to fill the lower half with more Paynes Gray. 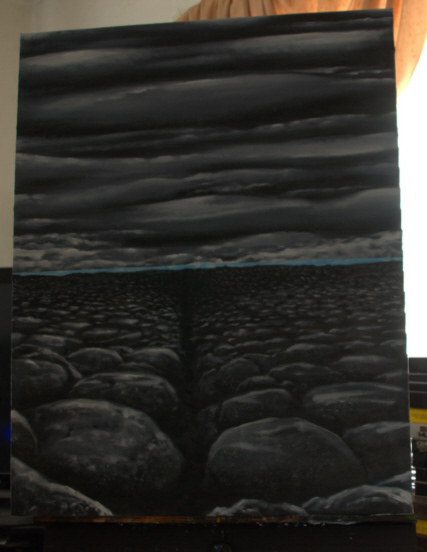 So I slathered that on, and then used white mixed with the gray to rough out a couple of large rocks in the front of the canvas. I didn’t get a good photograph of this stage–I got three bad ones. So here are all three, which might add up to one decent shot. 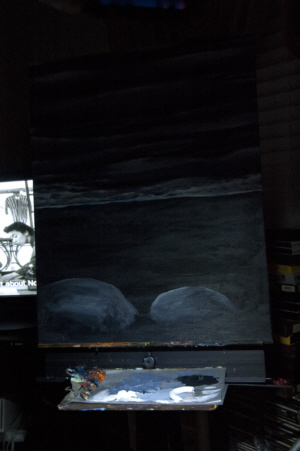 Since the paint is both dark and reflective, I tried to use a hand-held LED light in a dark room to see if I could take a picture without a flash. As you can see, that notion was an epic FAIL. Remember from last post where I said there was a surprise under the masking tape? It’s hard to see in the pictures above, but there is a tiny sliver of blue sky left over. The fragment above (and the one below) are from a later stage of the work, of course, but I wanted to show what it looked like in the current stage, and as noted I didn’t have a good photo of that. 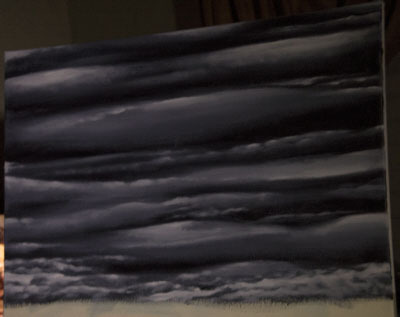 At any rate, the idea at the time was that I would take the new paint right up to the clouds, again using masking tape for the horizon, but since the clouds were still wet–and thus susceptible for smearing under the tape–I figured I’d go as close as I could, wait til the paint dried, and then use the tape. But the more I looked at it, the more I liked that tiny sliver of blue. Even though it meant that the clouds above no longer “made sense” (unless the blue was a sunny sea, in which case the clouds could be a huge, distant, onrushing mass, or something), I still thought it added to the work. The blue itself was a bit sketchy, with leftover white blotches and blank canvas, but once everything dried (or came close enough) I filled in the rest. Again, the fragment below is getting slightly ahead of our story. Then it was time to work on the land portion of our pictmission. 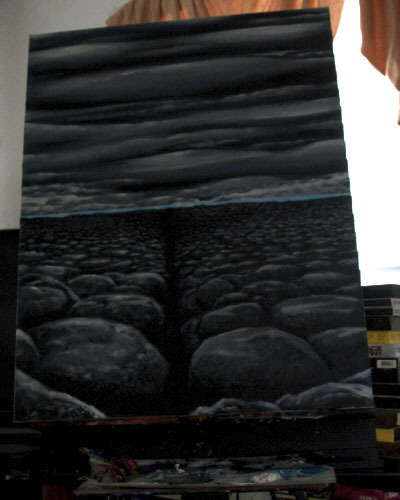 I started using white-and-gray to rough out more rocks, growing progressively smaller as they neared the horizon. For some reason, I kept the “center lane” there unadorned. I don’t know why. I suppose that’s why I paint. Because I don’t know why. 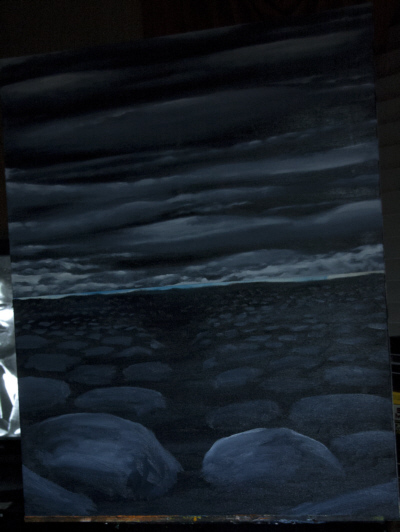 The rushed nature of the upper-right shore (right under the clouds) bothered me (I was probably drunk when I painted it). So I tried to make it look like its left-ward sibling (only a little successfully I should note). And that is pretty much how it stands as of today. For the most part, it seems finished–there may be some tweaking of details here and there, but overall I’m quite satisfied with it as it is. It seems to have a quiet, dark, ancient power in the rocks, with a kind of forceful potential in the clouds. Or maybe not. One thing I can say it isn’t is bright and sunny, which the original blue-sky-with-clouds image was supposed to be. 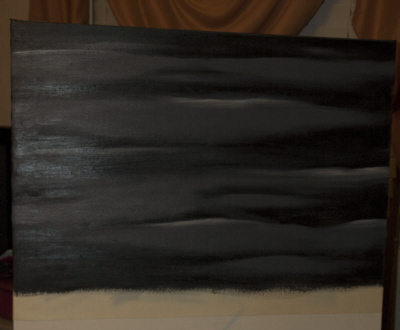 That original image ended up making me dark and gloomy, and as any painter can tell you, turnabout is fair play. And that’s that. Thank you again for visiting. I hope to post more often, but then I always say that, don’t I? When I started this blog (originally on Blogger over nine years ago–my God, talk about another country and the wench is dead), I used to post daily at least, sometimes more than once. When I started doing the Paintblogs, the intention was to post daily progress on a particular set of works. You can see how well that’s worked out in recent months. Now, the post per work comes all washed up in a giant wave as the work nears completion, in a flurry of bad photos. This is somewhat understandable, I think. (Or at least justifiable.) For one thing, I don’t paint every day, and when I do paint, sometimes it’s just a matter of a touch-up or two–in other words, nothing that really calls out to be shouted in public. And to be honest, given the times we live in and the state of the nation, I have less and less confidence that my work will ever amount to anything. Anything, that is, other than “hand exercises” or “attempts to keep up an unhealthy fantasy” (I’d love to be a millionaire painter, but I no longer believe that can be achieved through talent). There are also those bad photographs to consider. Try as I might, PhotoShop eludes me as a way to make them more presentable (though there is slow progress). Taking the pictures, deciding on which ones, arranging and uploading them–all of that takes work, and I’m a lazy sod at heart. Anyway, that’s why the blog tends to be somewhat on the quiet side. Painting comes and goes, and while I do have a variety of drafts on other subjects, I keep reading them and thinking that others have either a) thoroughly discussed and discarded the points I raise, or b) answered my questions so completely that my asking them bares my backwardness for all the internet to see. That said, here are some images for a work I’ve been dabbling on, off and on, since November or thereabouts. I mean, dabbled on since dabbling on it back earlier in the year, that is. What does that mean? Good question. Here’s another good question. Do you remember this picture? Well, guess what. It doesn’t look like that now. I looked at some clouds one day during a sky that threatened rain, and I wondered–instead of building clouds from the light in, could I build them from the dark out? 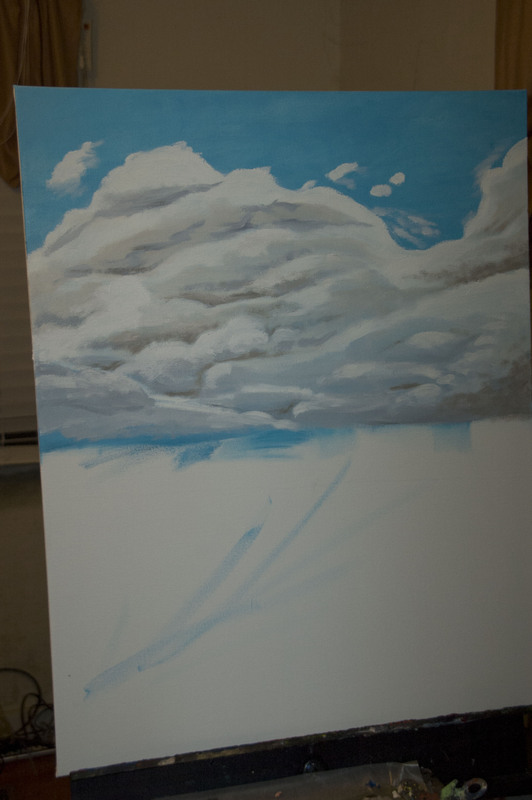 So I put a piece of masking tape near the bottom of the clouds, then started with this. 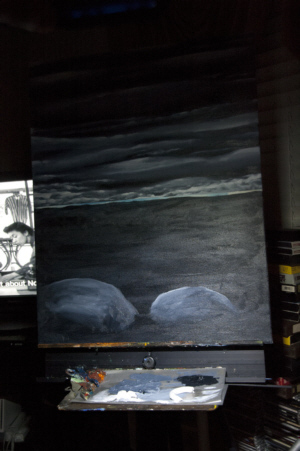 The pigment used there is called Paynes Gray, and I’ve lately been using it as a substitute for black. Normally I use Raw Umber, but Paynes Gray seems to have a nice neutral, non-organic cast to it. 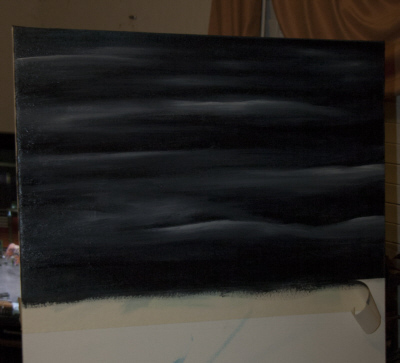 Anyway, I then started brushing white into the wet paint, and got a preliminary framework. Already I started to like the way this looked. Not exactly sunny, as originally planned, but I thought the shaping was interesting. I then added some gray and white mixed paint to try and bring out the larger bands. Normally, I would have added all the preliminary shots between these two stages, but instead I’ll point you to a YouTube video where you can see how it evolved over time. That video can be found HERE. Yes, I had to add a soundtrack on it, that’s not something wrong with your speakers. I felt fairly satisfied with progress so far. 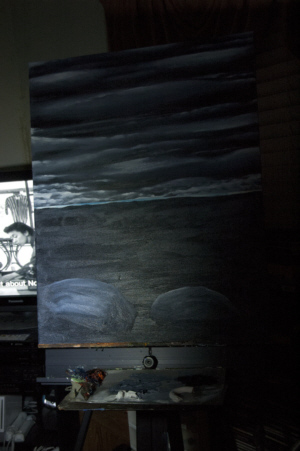 One idea I had was to put light blue sky in the midst of some of the dark patches, in order to imply a sky behind all this mass. However, I liked the 3-D effect enough so that I abandoned that idea…or so I thought. The masking tape is still in place in the images above; when I removed it, in order to work on the lower half of the picture, there was a bit of a surprise. And what happened in the lower half of the painting? Well, get ready for Quid Malmborg in Plano, a below-the-belt, bottoms-out revue! Ha ha ha ha! Oh…oh, it’s not til tonight. Well, thanks for visiting anyway! Exit right to Funway, which is already in progress!